Long Tail Pro - Is it still the Best Keyword Tool? If you know anything about internet marketing then you probably have heard about Long Tail Pro Platinum and what can you do with it. First of all, before we start off, let’s learn a little bit about what keywords are and how people use Google to search for things. Keywords are something that hold a lot of importance and are, without a doubt, one of the most vital parts of Search Engine Optimization (SEO). It goes without saying that if you want your website or blog to reach the top of Google, then you must have ample knowledge of what keywords are and how they work. I’m going to make it as simple as possible for you. 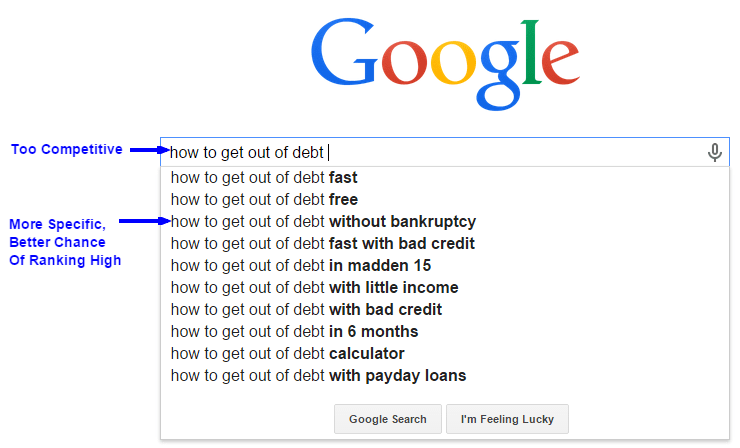 People search Google mostly in 3 ways. They are broad in their search (short tail keywords), they are very specific (long tail keywords) or they’re kind of in the middle (medium tail). But as you might have guessed, almost all the time people like to get as specific as possible. That means if your site ranks high for more long tail phrases, you will get a truck load of traffic, and huge traffic = $$$. Looking at the phrases above, you can forget about ranking for number 1 and 2. They are very competitive and you’ll have large companies and tech blogs to compete with, you can’t do that. However if we look at number 3, you can easily rank high for these long tail keywords with a little bit of work. So in order for your site to be successful, try to rank for as many long tail search phrases as possible. If you’re able to do this, you will get targeted traffic and your conversion rate will be sky high. Now you might be wondering, how in the heck do I choose which Long Tail Keywords to use? Don’t you worry at all, read on and you’ll be an expert of long tail keyword research in no time. How do I rank high in Google? This was the question I had when I was starting my internet marketing journey. And to be true, it caused me a lot of headache and problems. I struggled for a long time and it took me a lot of trial and error to finally figure out what exactly do I need to do in order to get in the good books of Google. It turned out to be really simple. Of course a lot of things matter if you want to see your site in that number 1 spot but the most important has to be, good and user friendly content. It’s as simple as that. Now that doesn’t mean that you can stuff your articles or blog posts with as many keywords as you can find. Trust me, you’re gonna get penalized. Instead write in a fluent and natural way and blend the SEO keywords as subtly as possible. Once I figured this out, I embarked on an epic journey to find the best keyword search tool I could find. I tried numerous keyword suggestion tools but only found 2 to be worthwhile. The other ones were not up to the mark. This is where Long Tail Pro came into the picture. It is a rather simple but a very powerful piece of software created by none other than Spencer Haws. He is just a normal internet marketer dude just like you and me, who had the exact same questions. How to find long tail keywords? So he gave life to one of the best long tail keyword finder in the market. The software is very simple and easy to use. All you have to do is put in your seed keywords and the program will go and fetch related keywords from the Google Keyword Planner Tool. You’re probably thinking how is it different from all the other keyword search tools out there? I had the same question when I first heard about it. Then I decided to investigate further and research a bit about the software. After I read many positive reviews, I gave it a go and made the $97 purchase. And it was the best decision I ever made. As I started using it I was blown away with all the great things it could do. Since then it has made my keyword discovery process a lot easier and fun. It offers heaps and heaps of long tail keyword suggestions for any subject or niche that you could ever think of. It not only offers keyword suggestions but it also analyzes any keyword search phrase, including long tail, with a proper breakdown of the top 10 sites in Google for that keyword on the basis of important metrics like site title, description, inbound links etc. A quick 5 minute setup. Fairly simple to use and newbie friendly. A 10 day free trial to check out the software. One time payment for Long tail Pro and if you want some extra features like KC (Keyword Competitiveness), you pay a little more each month for Long Tail Pro Platinum. Thorough step by step instructional videos to get you started. Access to the huge Long Tail Pro user community. Use KC (Keyword Competitiveness) to find out how difficult is it to rank for a keyword. The software calculates this for you but this feature is only available in the Platinum version. It’s immediately available for download after purchase. A huge list of Long Tail Keywords extracted from a phrase or a seed keyword. Is Long Tail Pro For You? Are you tired of scouring all over the web for SEO keywords? If you’re struggling with your keyword research then I would highly recommend this keyword tool. It will genuinely make your life easier and save you a lot of trouble and time. This software is speedy and it will do all of the work for you. You don’t have to trawl Google to look at competing websites, Long Tail Pro will tell you if you can rank for that keyword with KC (Keyword Competitiveness). It has a clean and modern interface which you can master in no time. You don’t have to install anything else to run this software, you just need the latest version of Adobe Air and a Google Adwords Account, which is free. Even if you’re a newbie or pro, it doesn’t matter because everyone can benefit and use this tool to their advantage. You just have to enter a seed or main keyword, and long tail pro will spit out long tail keywords all day long. Take those keywords and use them in your content, and in no time you will start to generate free traffic and more importantly, a passive income. I would be straight up with you, if you’re always struggling to get motivated to write content or simply if you’re not that much serious about content marketing or making money, I would say don’t waste your money. You’re not going to get anywhere. However if you’re serious about changing your luck and want to provide value and great content to people that will lead to free traffic and revenue, then you should at least try this product. It comes with a 10 day free trial and if you like it, you can purchase it after the trial period. Simple as that. NOTE: Everything is explained in the video above. 1. Enter in your seed keyword. 2. You can check out the additional options below which includes, entering your own keywords, fetch additional data and applying filters. These are optional. 3. Click on Generate Keywords and wait a couple of seconds. 4. Then you can sort from lowest to highest or highest to lowest search volume. 5. If you have the platinum version, you can use the calculate KC button to check out how difficult would it be to rank on page 1 for that keyword. It gives out a number from 0 to 100, with 0 being a piece of cake and 100 being the impossible to rank for. Any keyword below the number 35 is good to target. To be true, majority of the tools in the market are clunky and poorly made, they add more trouble instead of helping you out. As I have used Longtail Pro, I think it’s safe to say that it trumps nearly all of them. If you’ve been searching for a unique, clean, powerful and easy to use SEO software/keyword research tool then I would say definitely give Long Tail Pro Platinum a go. Trust me, it will make your life easier and will handle all of your keyword search burden. Woah this specific weblog is wonderful i love reading you.. best free long tail keyword tool Continue being within the excellent artwork! You currently know, plenty of people usually are shopping around with this data, you may assist these folks greatly.